Fresh hope has arisen that mining could resume at a Cornish mine after a big increase in the world tin price. The cost of tin is now £4,700 a ton - a rise of £1,000 in only a few weeks. The owners of South Crofty tin mine, Baseresult, say it gives them added confidence they will be back in production within two years. Mining historian, Alan Buckley, said the price increase could be a setback for anyone who wanted to develop the site for other uses. "They will probably be worried about the increase in price because it might throw a spanner in the works. "If the tin price was to go sufficiently high, large financial backing would come to the project to reopen South Crofty." Baseresult technical director David Stone said he was delighted by the news. "It gives us comfort, and those people who are investing in us to sustain the operation so far. "It means we can be very positive about going back into production." 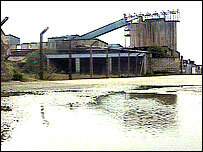 South Crofty closed as a working mine in 1998, bringing to an end a 3,000-year-old tin mining tradition in Cornwall. The Camborne, Pool and Redruth Regeneration Company wants to push through a compulsory purchase of all or part of the site so it can improve the run-down area. But Baseresult says it believes there is a realistic prospect of breathing new life into the prominent site.